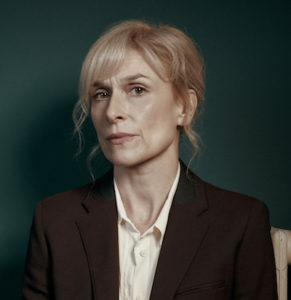 Amelia Bullmore stars in DEEP STATE as “Olivia Clarke,” British, late 40’s, Max’s ex-wife and Harry’s mother. Olivia knew what Max did for a living – more or less – but him leaving took her by complete surprise. She cauterized the wound and moved on with her life. She adores her son, Harry. Olivia now works for the Morning Herald, a national newspaper in London. Amelia Bullmore started her career writing for the stage and has moved into acting for radio, television and film from there. Following a five year stint on Coronation Street early in her career, she took on roles in BAFTA-winning BBC comedy I’m Alan Partridge and crime drama Ashes to Ashes. Amelia has starred in detective drama Scott & Bailey, ITV’s Jekyll and Hyde and BBC’s Happy Valley. Also a talented writer, her writing credits include the award-winning play Mammals and episodes of Scott & Bailey.